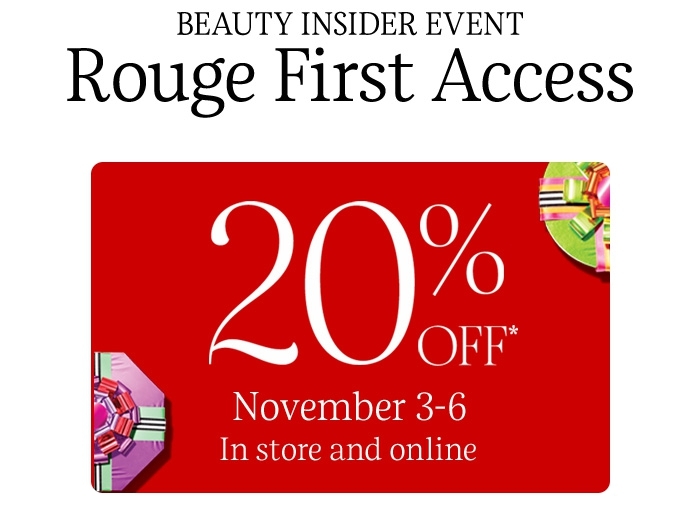 Rouge First Access, 20% off with code 20FORROUGE, valid 11/3 through 11/6! Rouge enjoy 20% off with code 20FORROUGE, valid 11/10 through 11/15! VIB enjoy 20% off with code 20FORVIB, valid 11/10 through 11/15! BI enjoy 15% off with code INSIDER15, valid 11/10 through 11/15! "*Offer valid for Rouge members only in Sephora U.S. stores, Sephora Canada stores, and online from 11/3/17 to 11/6/17 at 11:59 PM PDT and also from 11/10/17 to 11/15/17 at 11:59 PM PDT with any merchandise purchase. 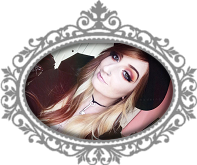 On Friday 11/3/17 in stores only, one guest of Rouge who is a member of the Beauty Insider program and is present at the time of redemption will be eligible for 20% off all merchandise purchases. No minimum purchase required. Non-transferable. Not valid on previous purchases, purchases of gift cards and eGift cards, ColourPop branded items, packaging, applicable taxes or shipping & handling charges. Not valid on purchases of customizable sets online or through Sephora’s Customer Service. Clients are limited to the purchase of 1 Dyson branded item per SKU per transaction and 5 Pat McGrath eyeshadow palette SKUs per transaction during this promotion. Canadian clients are also limited to the purchase of 3 Fresh, YSL and Dior branded items per SKU per transaction during this promotion. Beauty Insider status must be Rouge prior to redeeming this offer. Cannot be combined with any other offers. Sephora employees are not eligible for this offer. Not valid on orders shipping outside the U.S. or Canada. Return of discounted merchandise will be for the price actually paid. Promotion card has no cash value and may not be altered, sold or transferred. Sephora is not responsible for damaged, lost or stolen promotion cards. This offer is subject to change, alteration, or termination by Sephora at its sole discretion at any time. If you recently qualified for a new tier, please check your email for an updated offer. † Free Sephora tote (dimensions 14” x 12” x 4.5”) with any merchandise purchase. Offer valid only in Sephora U.S. and Canada stores. Offer valid Friday, 11/3/17, or while supplies last. Beauty Insider status must be Rouge prior to redeeming this offer. One guest of Rouge who is a member of the Beauty Insider program and is present at the time of redemption will be eligible to redeem with any merchandise purchase on 11/3/17 only. May not be sold or otherwise transferred. Quantities are limited. Bags are provided on a first-come basis. Limit of one per client. Not valid on previous purchases, or purchases of gift cards or eGift cards. No returns or exchanges. Not valid for cash or cash equivalent. This offer is subject to change, alteration, or termination by Sephora at its sole discretion at any time. Sephora employees are not eligible for this offer. If you recently qualified for a new tier, please check your email for an updated offer."